Oscar Acosta was born on April 8, 1935, and possibly passed away in 1974 under mysterious circumstances. Various rumours suggested that he was alive, however. The most notable was an anecdote in Paul Perry's Fear and Loathing biography that Rolling Stone received a hospital bill for a broken arm for a patient named Oscar Acosta in 1977 (RS was unable to trace the bill any farther than the hospital). He started out as an anti-poverty lawyer after passing the bar exam and took his own shot at running for sheriff of Los Angeles County in 1970. A powerful writer and speaker, he wrote two books: The Autobiography of a Brown Buffalo and The Revolt of the Cockroach People. A collection of his writing was published in Oscar Acosta: The Uncollected Works in 1996. The new Criterion Edition of FLLV, released in 2003, contains footage of Oscar speaking. Wikipedia has a nice little summary of Oscar's life; check out the links at the bottom of this page for more information on Oscar. 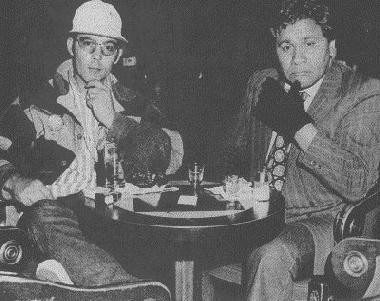 This is the infamous picture that appeared on the back cover of Fear and Loathing in Las Vegas. Oscar insisted that the picture be used, even though he risked exposing himself. Numerous parts of FLLV had to be changed at his insistance as well; for example, he is referred to as a Samoan instead of Chicano. He also wanted co-authorship, which in a gonzo sort of way, was right. His son, Marco, spoke to Peter Whitmer, author of When the Going Gets Weird. Spanish and South American literature is often known for its religious and mystical qualities. While they are quite unlike Oscar's books, Gabriel Garcia Marquez (One Hundred Years of Solitude) are kinder, gentler books, but the symbolism in both are overpowering. -Oscar and Hunter's first meeting. 30 seconds before fatal shot - read caption on picture. Check the master list, Better Than Search.com for more gonzo links. -San Antonio Public Library Latino Collection - good reading list.